We're still working on editing the photos from our recent BLUFF CREEK TRIP, so look for that and our ANATOMY OF A BIGFOOT HOAX DVD report, and much more, soon. So much is on the back burners that we're not sure what is getting overcooked. Apparently the Bigfootery Enquirer is trying to draw us out, and so be it--see below. A new report is in from our local area, and will be mentioned below. So, for now, on we go with this BREAKING NEWS, and good news it is! (For now?) If you're tired of the BFF stuff, just skip past the red text below. Image: The Willow Creek Ace Hardware Bigfoot mural, painted by Duane Flatmo. Photo by Steven Streufert. Back from the dead, and hopefully reborn and not undead, the new BFF is up and accepting registrations from all comers. A new host, The Centre for Fortean Zoology, looks like it will be able to professionally and responsibly handle this former can of worms. We are hoping that it will prosper, and remain on this side of human decency and ethics. Let us all participate and "act like adults" in the spirit of free and reasonable discourse on the topic we all love... BIGFOOT! All former members, banned or otherwise, are being accepted, assuming that they live by the new rules. We were new member number 30 this time around. Find us there: "BigfootBookman." No anonymity for us! The old content, which so many have been worrying would be lost, WILL BE RESTORED, gradually, complete with images. Or so they are saying... We are calling off any boycott and protest movements for now. Let's all give it a chance to work; and the more good, fair, and kind people on there the less chance it will become like the old, messed up version of the BFF. 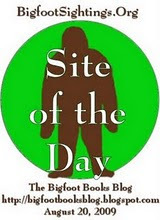 "Welcome to the new Bigfoot Forums. As you are probably aware, the old BFF was closed by the owner Brian 'Bipto' Brown. After some negotiating, Brian agreed to transfer the domain name and the forum's content to the Centre for Fortean Zoology. As a result of that, this new forum has been created. The content of the old forum will be imported as soon as possible, but it will take some time to get this done correctly - we intend to make use of the 'gallery' facility for all the old images. The old forum became fraught with difficulties, grudges and a whole heap of disgruntled members. This new forum is different - if you want to participate in the new forum, you will be expected to leave those grudges at the door. We expect members of this new forum to be more respectful of others and of the various bigfoot groups - if you can't be constructive, then this probably isn't the forum for you. The administration of this forum will be very different to the old BFF, although you will need to bear with us while we get things up and running. The forum will have no more than two 'administrators' at any one time - admin will not be responsible for the moderation of the forum other than carrying out the instructions of the moderators and Steering Committee (eg. banning members), and of course removing spam accounts and other forum maintenance. The intention is to moderate the forum by means of fixed-term moderators - initially on a six month 'tour of duty' - after those six months are up, the moderator will return to member status and a new moderate will take their place. Moderators will be chosen by the CFZ management. This means that far more of the members will be expected to help run the forum than before. Given time, we hope to reduce the 'tour' to a three month term - we have seen that long-serving moderators stop being effective after too long and become somewhat jaded. Fixed-term moderators shoudl fix this problem. Moderators will no longer have the ability to moderate the entire forum - their duties will be divided into sections, that way, if a member has a personal problem with a moderator, they will be able to avoid the moderator in question until the situation has been resolved. Members are expected to assist in the moderation of the forum by means of the 'report' button, and only by means of the report button. If you don't get a personal reply to your report, do not assume that it has not been read and actioned - all reports will be read by the moderators. The function of the board and the moderators will be overseen by a Steering Committee - this committee will be selected by the CFZ management - the makeup of the committee has yet to be decided, but it is expected to include members of CFZ, members of bigfoot organisations and individuals from the forum. The main function of the committee will be to highlight issues to the moderators and to act as an 'appeals panel' in the event that the moderators take action that a member disagrees with. In other words, to ensure that the moderation is fair to everyone. Feel free to re-register using your old username, or to use a new username if you prefer. Registration is open to everyone, including individuals who have been previously banned. If you plan on using your old username, it is important that the email address you use matches the email address you used on the old website - if it doesn't, you will be expected to explain why not. If you cannot prove 'ownership' of that username, you are likely to be banned for trying to impersonate an existing member. Lastly, have fun. A lot of work is going into making this a completely different place from the old BFF, we would appreciate your help in keeping it that way." We here at Bigfoot's bLog are hoping for the best. We hope they will give everyone a chance there, for sure, and that all will behave within reason. We saw a lot of old, familiar user names back on there already today, including BitterMonk, Masterbarber, and Kitakaze. Let's hope everyone will treat this opportunity with respect, even snarky old us. If we see BS, we swear, we are just going to walk on right around it! Or, at least, we will try to do so--sometimes these issues have a way of drawing one in when one least wants or expects it. And here we would like to offer our great thanks, and appreciation, to the founder of the BFF, BRIAN BROWN, for first fostering, and now preserving, this site. It has great value as an archive, and hopefully for the future of Bigfooting, too. THANKS, Brian! * Go to the website, BIGFOOTFORUMS.COM, the same old URL. 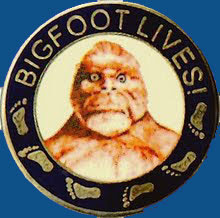 * Be a "fan" of Bigfootforums.com on Facebook to be kept up to date on the issues (and meet all those other cool Bigfooters out there--even Igor Burtsev is on there!). The Link? It's HERE. Speaking of "Kitakaze".... He had been claiming that it was HIS theories debunking the Patterson-Gimlin Film that brought the old BFF down. We of the "Gimlin Guard" believers faction just couldn't handle it, man. The BFF just collapsed from the top-heavy weight of Kit's debunking. Now he has backed off and admits, "I am not important. 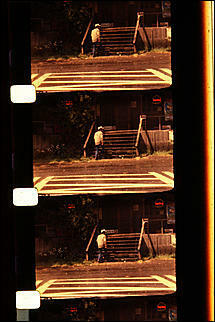 The film subject is important. I am boring." We recall an original post by him in the BFF Implosion thread, but now we cannot seem to find it... was it deleted? Over on the great Search for Bigfoot Forum Melissa Hovey and others have revealed some interesting details, observable in this link (be sure to click the images, enlarge and read them). Perhaps this conspiracy and the coming documentary he's supposedly making can be shut down just like all of us stopped the Bluff Creek Massacre theory in its bloody tracks before they could make books and films based on it. If not, watch out Kit--the Gimlin Guard is coming to get you! Mooohaaahahhahaaa. Seems like a cool dude to us, anyway. Rumor has it he likes Joy Division, so there, that's cool. Here's Kit's JREF post, "Calling All Skeptics! 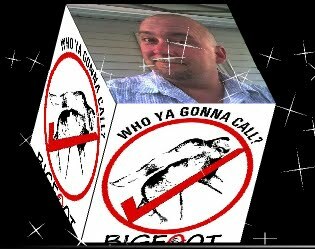 Help Kitakaze End PGF Controversy - Pitch to Discovery Channel"
"When out looking for Bigfoot on the internet, watch out for Trolls." "Internet troll (or simply troll in Internet slang): someone who posts controversial and usually irrelevant or off-topic messages in an online community, such as an online discussion forum or chat room, with the intention of baiting other users into an emotional response or to generally disrupt normal on-topic discussion." Read more: PURSUIT MAG on Internet & Cyber Crime Terms and Definitions. Go to the GCBRO message board through the link above. You'll be astonished. Apparently M.K. Davis has let this one go, and the "Massacre" thing has been taken over by new apostles. Scan down the list, or just read or do a search for any topic on there about Bluff Creek, John Green or Al Hodgson. Image, above: from the Bigfoot Busters BlogTalk home page. It does not depict Lansdale. 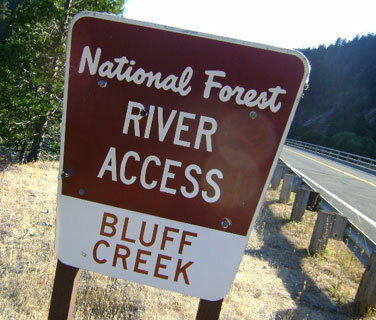 Bluff Creek sign photo by Steven Streufert, taken 2009. Our friend and Bigfooting ally, Cliff Barackman, recently posted some really cool information and images on the individuation of apes. Visible in these images is the personality and individual variation that is clear in these intelligent and sentient beings. They are not mere beasts. Look into their eyes and tell us that you don't see at times more humanity than one sees in the stultified, hypnotized and overfed faces one sees walking down the streets of your town. This isn't just anthropomorphism--there's really someone looking back at you. 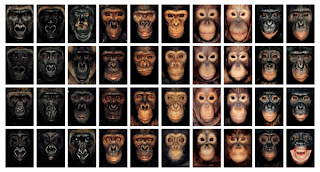 READ MORE HERE: STARE INTO THE EYES OF 40 APE FACES on his North American Bigfoot Blog. This just in... a very reputable, gainfully and professionally employed, and very sane local individual was out with a hiking partner, heading out of the Hoopa area up into the edge area of the western Trinity Alps, and they got lost, despite having a GPS unit. They had to camp in the raw that night, without gear or a fire. This is preliminary information only. We know the nephew of the reporting party, and will be inquiring further for next time. Our friend said, "She said the first 20 seconds of this clip [as below, give it a listen, and hear what she heard] and these are her words..."
"Didn't hear tree knocks... heard huffing, which I thought was a bear (and I saw its eye shine in my headlamp -but Bigfoot would have been about the same size) - and then many hours later some sounds like the very first ones on the link... you sent me - I thought perhaps coyotes but it didn't sound right for them, and the habitat was wrong for coyotes. There were also some crashing-around sounds in the middle of the night that I never figured out for sure." It is always interesting to hear reports of sounds that replicate the "Samurai Chatter" that is heard in the Sierra Sounds recordings (1972-1975). Either it is the same ordinary animal out there making very odd noises, or perhaps the witness was just too close to a call-blasting Bigfooter camp... or, those strange old recordings come closer to validation. The sounds are very strange on their own; but if we can find similar sounds in association with sightings or Bigfoot-related signs, tracks or sightings, then we can more reasonably assume they might be the actual vocalizations of the Sasquatch. 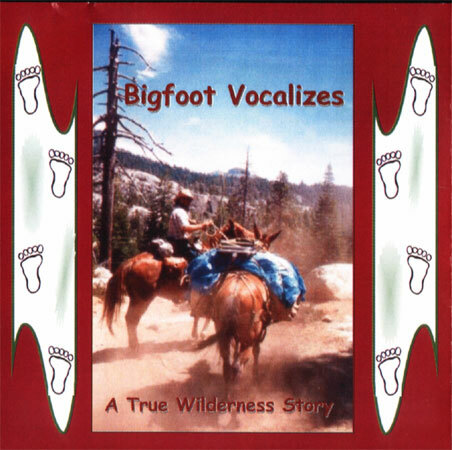 But, has anyone ever SEEN Bigfoot vocalize? We'll try to find out more for you in the future. THE BIGFOOTERY ENQUIRER seems a bit teed off lately. Or, is that anything unusual for them? Well, soon they will be outed (on September 12th) by Steve Kulls, the SquatchDetective. On his show on BlogTalk, Kulls will be having a round-table discussion (click link to listen live on September 5th, or to get the archived version afterwards) on the Enquirer and speculations as to the identity of its anonymous snarky writer(s). Read their latest post, GORILLAS IN OUR MIDST here, and tell us: Are they talking about BIGFOOT'S BLOG in the first long paragraph? Could they be talking about Mr. Kulls in the second one? Or are WE just getting a little paranoid, too? We say this, BFE: Better to be a gorilla, any day, than a pig in a poke, hiding anonymously in the bushes of some squalid little farm. 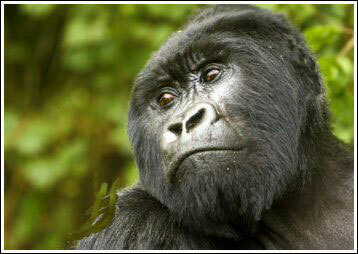 If we're a "gorilla," we're happy about it, and howl with laughter. Guess what? DAVID PAULIDES was on Coast-to-Coast AM last night (August 29-30, at 12:00), and he did a pretty darn good job of the two hours of discussion. He finally brought out his genetic analyst for the second hour, and it was satisfying to hear that they are making progress toward identifying the type of animal that left the hair samples they found a while back in our area up here. We did have a few differences over facts, but overall it was... Great! We're glad to see Bigfoot reaching so many millions of listeners with a reasonable presentation of belief rather than just mockery and hype. Sure, we don't always agree with him, but we're willing to say, that's OK. This show may be had by Streamlink subscribers only via streaming archive. However, we recorded it, so if you really want to hear it come by BIGFOOT BOOKS and we'll play it for you. The image that follows was sent to us by one of our readers. Apparently Bill Munns thinks it is Roger Patterson. The question? Does anyone know more about its origin? When it was shot? The LOCATION of the image? We are asking around with some of the Willow Creek old-timers to see. If you can help do let us know. Thanks! Me like looks of orangutan girl in picture up there. Me want. You bring? Bigfoot get lonely when no Bigfoot woman come to where I wood knock. Me make sad howl, Bigfoot hunter hu-mans think it to talk to them. No way! Me start make track down in Willow Creek hu-man place. Me look in window. Me see hu-mans watch Legend Boggy Creek. He lonely too! They say "Last of his kind." Me want to steal their popcorn. It get hard for Bigfoot survive when me such horndog. Bring me ape lady. Me go back to woods in mountain and not eat pet cat.